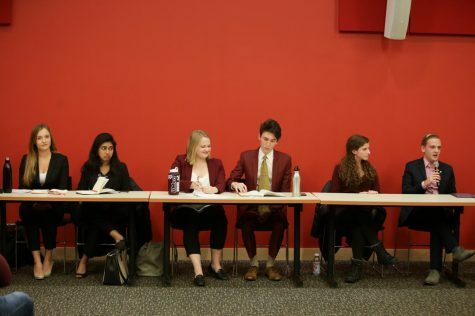 On the eve of the Student Government Association’s annual elections, the candidates for SGA president and student trustee are jockeying to garner as many votes as possible and are expecting the best. The SGA elections for president and student trustee begin Tuesday after weeks of campaigning. The elections start at midnight on March 8 and end at 11:30 p.m. on March 10. Students can vote at the Campus Center Tuesday through Thursday between 9 a.m. and 5 p.m., or any time online at CampusPulse. SGA Chancellor of Elections Zach Dawson is working hard with the elections commission to make sure everything goes well. “We want to have a smooth running online election,” said Dawson, who was named this year’s chancellor at a Nov. 11 SGA meeting. Dawson explained that the commission doesn’t just work this one week, but that they have been working leading up to the election, too. 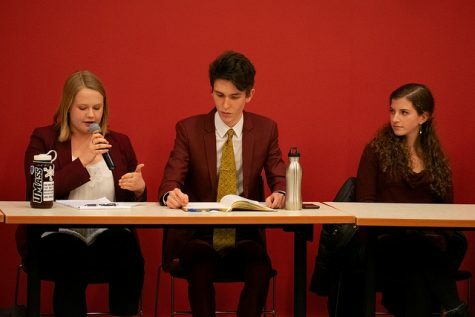 “We have been advertising through The Collegian, around campus and through our debate,” said Dawson, referencing the March 1, Collegian-sponsored debate between the candidates for president and trustee. “We are expecting a close race, but we’re expecting to win,” said Lamb confidently. Lamb is running alongside the current UMass Democrats president, junior Emily Jacobs. The pair is running on the platform that they are the ticket which can best serve the needs of UMass students. One of the senator’s current projects is what he is calling the UMass FreeDD program, a proposal which would provide free transportation services to students late on Friday and Saturday nights to ensure that people get home safely and don’t drink and drive. Another of the three candidates, junior public health major Yevin Roh, is running on the platform of bringing change to student organizations and attempting to make the SGA more reflective of the student body. As a member of many Registered Student Oganizations (RSOs), Roh is an active member of the UMass community who says he hopes to bring a student-centric change to the SGA which would embrace cultural diversity on campus. Roh and his running mate Widlynn Louis both hope to bring awareness and services to underrepresented students. “The students I have talked to [about my stances] respond very positively,” said Roh. “They are happy to hear there is someone running who has fought for students on a policy, financial and advocacy level,” Roh said. “Students are especially receptive to the peer judicial boards, and the comprehensive changes to the sexual assault policy I have been working on,” he said of revisions to the Code of Student Conduct (CSC) he has been central to drafting, focusing on what constitutes consent and making legal definitions more practically understandable. 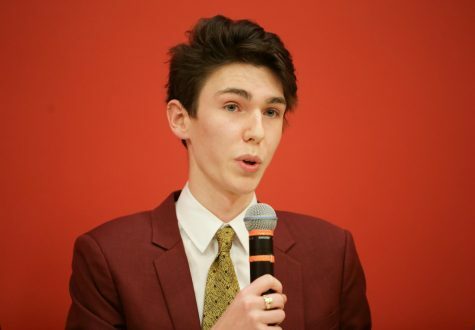 The final of the trio of candidates, junior Dave Robertson or, as he terms himself, the “Meal Plan Guy,” is looking forward to working with dining services to implement a rollover meal plan swipes proposal if elected, and says he would work to bring more funding to RSOs. 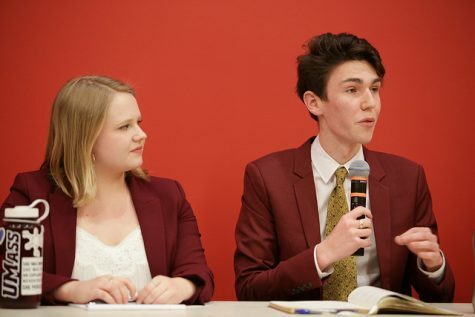 Robertson, alongside his running mate and current associate speaker of the SGA Senate Tina Kennedy, is also working on a larger scale to increase funding for UMass and to abolish a potential flagship fee that could be placed on UMass Amherst students if the University’s Board of Trustees votes to levy such a fee this spring. The pair will also look to lower fees and deal with the budget gap the University currently faces. “Our last minute preparations are not that substantial, as we have been preparing for these days for two weeks,” said Robertson. 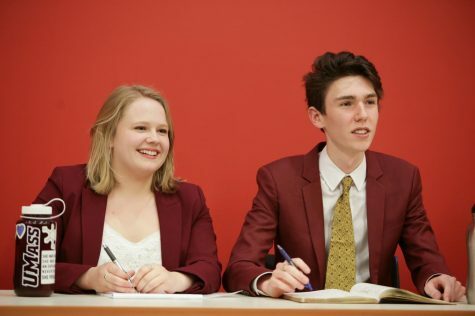 “We are trying to get people to vote for us by telling them the truth, talking about our experience, and showing our sincerity on wanting to better the campus with ideas that are new and haven’t failed in the recent past,” Robertson said. Robertson was the only candidate to admit he is a bit anxious leading up to the election. “On the eve of the election I am nervous, but overall excited to reach out to the community and talk to the students and see how I can work for them,” he said. Where the Irish Catholics in Mass?